I haven’t posted in AGES!!! I’ve been so busy with work and school and projects and presentations that the fun things in life got put on the back burner. About my hair… no change in my regimen. I’ve had a bun all week, thanks to my bun maker! I was trying to decide how to have my hair this past Monday because I had a huge presentation to do at work. I thought a bun was the traditional, conservative look, but I wanted to do a twistout because they come out so nice on me. Ultimately I did a bun because I got caught up with last minute school work on Sunday evening and my hair wouldn’t have dried in time. So if you’re been reading Curly Nikki’s blog, she uses grease in her hair. I did *gasp* when she told me this in person at the Curly Nikki Meet-up. I never really delved into why people with natural hair don’t recommend using mineral oil or petroleum based products, but that was like a big no-no. I noticed that after she said she used Dax grease, everyone just jumped on that bandwagon. I love Curly Nikki, I just think it’s lame that everyone is such a follower. In other news, my hair came out fabulous alllll of last weekend. 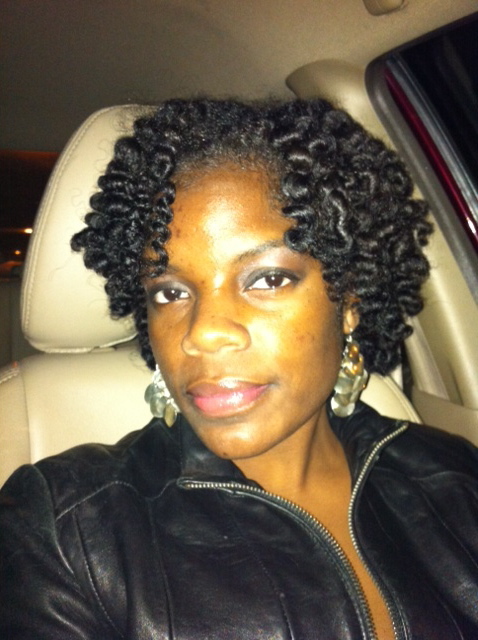 Here’s another twistout when I was going out for the night (I can’t blog without a picture huh? LOL) This was my first attempt at a “smokey eye” also. I like it! « Curly Nikki NYC Meetup! A picture is always worth a thousand words. Nice twist out. Are you furthering your degree? Thanks. Yeah, I’m doing a masters in nursing education. I started the Masters program, administration track a few years ago and dropped out after 4 classes at University of Phoenix online because I was just over school. I was even thinking of doing the Practitioner program before it became a Phd program, but heck…if I don’t have to y should I. Good luck. LOL! They still have NP programs here that aren’t PhD programs (I think). I’m sooooo NOT interested in being an NP. I’m only doing the masters because my nursing degree is an Associates and I feel like I need more than an Associates in Nursing. I originally went to school for Computer Science and did my Bachelor and Masters in that. I would actually loovveee to do my masters in Nursing Informatics, but my work schedule doesn’t permit me to. I’m not thrilled to be in school either. Can’t wait until it’s over! I did read that post and it wasn’t a big shock to me, cause when i was younger my mom always lightly greased my scalp after she washed it. My hair was natural and very health. I do know it’s not good to use to much of it. But with moisturizers and oils i don’t really need to use grease, it would be too much on my hair that’s fine. I would have to say and admit I am one to jump on a bandwagon, especially if a person raves about their results. I will try it once just to see,but this Dax I am not curious about it at all! Lol! So this is one bandwagon I will not be riding. LOL. I still have grease in my cabinet. I haven’t used it in forever. I don’t think I’ll be trying it anytime soon either. I like the way my hair responds to my Olive Oil mix. Yeah, everything with this hair process is trial and error. I feel the same about henna. I doubt I’ll be trying that though. I’m impatient.